Chelsea Market is in the same building where the Food Network Studios are located. It has a couple of specialty food shops, as well as bakeries, and a ton of small eateries. We went on an early Sunday morning, because the crowds gathered. It's a fun stop and a great place to grab a snack, especially since it is next to the Hi-Line. I noshed on an olive roll from Amy’s Bread; it took me right back to college, when I could eat ½ a loaf on the way home from babysitting. We had samples of brownies at Fat Witch (dry), and picked up sausage, cheese and snacks at Buon Italia. 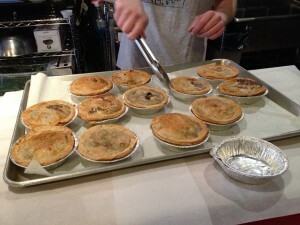 I decided to try an Australian meat pie from Tuck Shop. A tray had just come out of the oven, so my steak and Guinness pie was piping hot. There were large chucks of beef, and mushrooms in a green peppercorn and horseradish gravy. It was encased in a flaky crust. I really enjoyed it. The mini doughnuts ($6 for 6, $10 for a dozen) are made hot and fresh and tossed in to a brown paper bag with the flavored sugar of your choice. 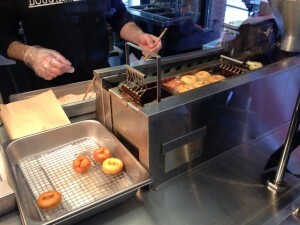 The doughnuts themselves are light, crispy and airy, but the sugars elevated them to the next level. We tried the Purple Cow (purple potato, sugar and bacon) and Paris Time (lavender, pistachio, vanilla sugar). I loved the purple cow – it was a far better method of incorporating bacon in to a donut than just pieces of bacon stuck in the glaze. I got bacon goodness in each bite. Error running style: S2TIMEOUT: Timeout: 4, URL: gltsoi.livejournal.com/157752.html at /home/lj/src/s2/S2.pm line 531.